I grew the dumbest tomato plants this past year… I mean really, the dumbest, lamest plants EVER. 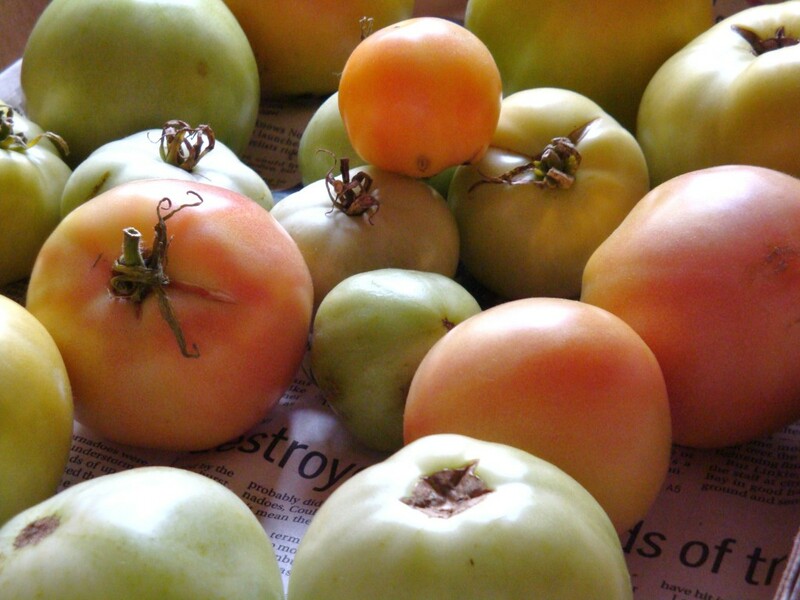 They have had tomatoes on them since the beginning of July…and they are still GREEN….ok, some have a hint of pale pink-ish blush, but they are taking FOR-EVER to ripen. Did I mention they were dumb? So I scoured the 2 canning books I have and not liking something about each recipe I came across, decided to take parts from each and created a new recipe. I must say, I am totally pleased with the result so therefore have to share. In a large bowl, combine tomatoes, onion and pepper and the pickling salt. Cover and let sit in a cool place (70F to 75F) 12 hours or overnight. Drain for at least an hour in a colander, then rinse with cold water and drain again for another 2 hours. In a large non-metallic stock pot, combine the vinegar, sugar, water, mustard seeds and celery seeds. Bring to a boil stirring to dissolve sugar. Add tomato/onion mixture and bring back to a boil, simmer 5 minutes. 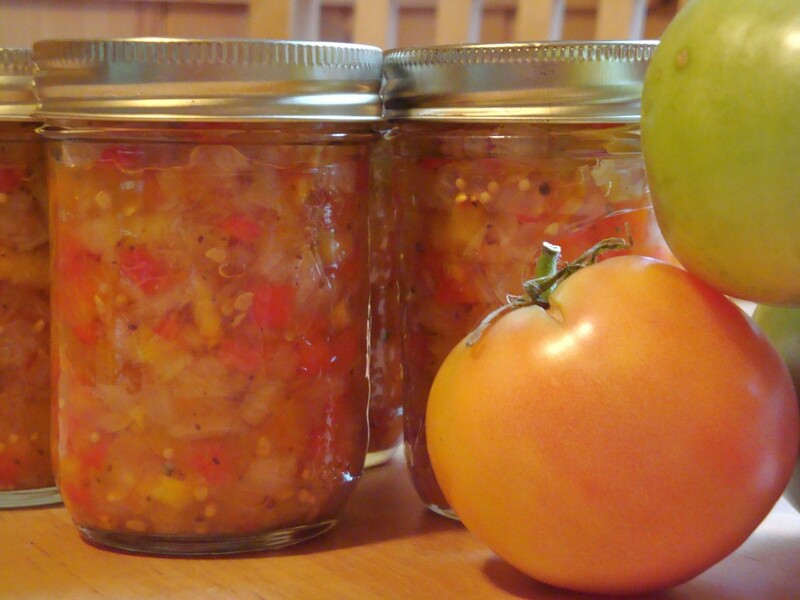 Ladle into hot, sterilized canning jars leaving a 1/2″ head space. Remove air bubbles, wipe rims and adjust lids. Screw bands on fingertip tight. Place in a boiling water canning bath and process for 5 minutes. Start timing when water returns to a boil. Remove and let cool on a wire rack undisturbed for 24 hours. Use a non-stick pot or dutch oven. A regular metal pot will interfere with the tomatoes flavour. My pots/pans are anondized so they are good to go. OK, makes sense. I will use my Le Creuset pots – they should be just fine! On the counter and cooling. Thanks again, my friend!! You are welcome my dear!!! I just wanted to tell you, that I served this to my company I had over the past 2 weeks. EVERYONE raved and LOVED it. I will have to make more next year. Thanks so much Ramona! So glad you are enjoying it Definitely make more next year, I enjoy it on so many different things too.